Facebook, the largest social network to connect millions has released a new tool, allowing users to convert their personal profile into a Facebook page. Confused? Be not be, as we help you out with even the itsy bitsy details. With the new tool, Facebook personal user profiles can be converted into an official business page, eventually, converting all friends in the list into fans. 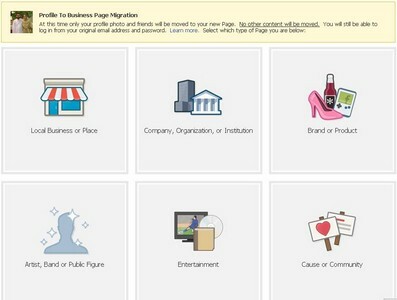 Tagged as “Profile To Business Page Migration” tool, will help out Facebook users who created their personal profiles for a business purpose. Those users have also added certain fans as friends. Be aware that when you convert your profile to a Page, your profile pictures will be transferred, and all of your friends will be automatically added as people who like your Page. No other content will be carried over to your new Page, so be sure to save any important content before beginning your migration. For those users who get stuck or want to revert from the migration can do so at this time. Be sure to download your profile information including photos, posts, messages, friends lists as after making a switch to the business page look, all information would go PUBLIC. The migration tool is surely an exciting news to business owners, with aim to benefit from the open possibilities. how can i switch from personal page to an existing fan page?